We are open 10am-10pm Mon-Fri and 10am-9pm at weekends. We are based in Thatcham, West Berkshire. There are carers and rescues all over the country. If we are not close to you then Use our map to find your nearest rescue and phone them. If the animal is screaming or bleeding please take it to the nearest vet. Sick animals do not have the luxury of time. WE ARE IN WEST BERKSHIRE. Please Note: We do not have vehicles to come and collect. We are a small charity run entirely by volunteers and we are always busy, there is an answerphone so please leave a message if you have a sick or injured animal. If you have a query or just want a chat please send a message using the form below or use our Facebook page. Link in the sidebar to the right. We do not have vehicles to come and collect. We are a small charity run entirely by volunteers and we are always busy. If the hedgehog is badly injured, screaming or dragging itself along, carefully pick it up in case of fractures, then take it immediately to the nearest vet who must treat under their Code of Conduct. Please visit the volunteering page and complete the application form. If you are looking for information what you need is likely to be on our FAQ page which you can reach from the menu at the top of the page. If you just want a chat please use the message box below or our Facebook page. Our animals are sick and wild therefore they get very distressed when seeing humans, we limit any contact to essential needs only. NB. We operate from our home. You will not see any large signs saying Hedgehog Bottom. 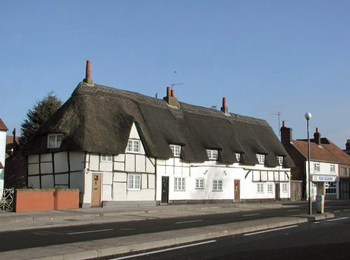 We are in a Thatched Cottage on the A4 immediately opposite Coombe Court and next door to The Four Seasons. Please Note: Your sat nav will stick you in a side road called Chapel Court. We are on the main road approx 20 yards from that turning.